Mark Zuckerberg is to meet with the UK’s culture secretary at the company’s headquarters in California on Thursday. 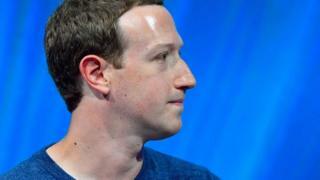 It follows 18 months in which the Facebook founder refused to address a parliamentary committee investigating accusations of significant failings at the social network. The BBC understands Jeremy Wright will be given about 30 minutes of Mr Zuckerberg’s time. Mr Wright told the BBC he hoped to discuss ways to prevent online harm. Facebook has been under intense scrutiny since the family of the British teenager Molly Russell claimed she took her own life after viewing material which glorified suicide on their photo-sharing site, Instagram. A white paper is expected to be published by the Department of Culture, Media and Sport in the "next few weeks", and will include input from various technology companies visited during this week’s trip. The UK delegation, which includes minister for digital and culture Margot James, will also have spent time at Google, YouTube, Twitter, Pinterest, Apple, Snap and Tinder. Mr Wright told the BBC he hoped the eventual proposal would become a model for other countries looking to temper Facebook’s negative impacts. "So there's good reason for these companies, be it Facebook or any other, to engage with us at this stage,” he said. Mr Zuckerberg did not, however, choose to engage with a DCMS committee during an 18-month investigation that culminated in a damning report published earlier this week. The report suggested the company knowingly violated data privacy and competition laws. One comment went as far as to describe the firm as being like a “digital gangster”. “The period of time that we've been through, where we've simply urged social media companies to do better and left them to regulate themselves, is a period that's now coming to an end,” Mr Wright said. The BBC understands that former UK deputy prime minster Nick Clegg, recently appointed as Facebook’s head of communications, will not be attending the meeting. In the past, Mr Clegg has spoken of his desire to produce “co-regulation” with governments, an approach Mr Wright said he did not plan to embrace.